The 31st European Health Psychology Society Conference (29 August – 2 September 2017) was an important event in the HBCP team’s calendar, with Professor Susan Michie, Professor Robert West and Dr Marta Marques (UCL), and Professor Marie Johnston (University of Aberdeen) all presenting. 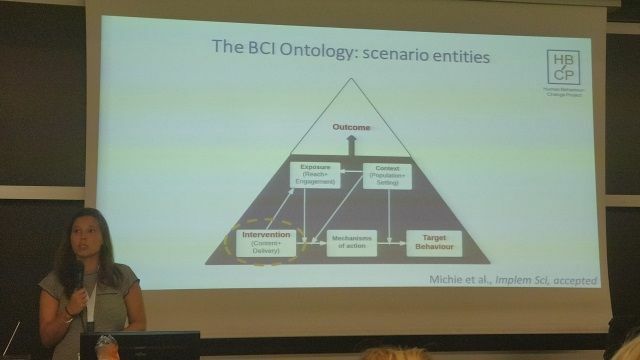 On Wednesday 30 August, in a symposium on novel approaches to evidence synthesis, Marie Johnston gave a presentation highlighting the merits of developing a Behaviour Change Intervention Ontology (BCIO), which will be one of the major outputs of the HBCP. She explained how the ontology could aid in the systematisation of research, making it machine-readable and streamlining evidence synthesis. In a parallel session dedicated to methods for building better behaviour change interventions, Marta Marques summarised completed work and next steps towards developing population and settings taxonomies, which will feed in to the BCIO. During this session, Dr Rachel Carey (Honorary Research Associate at UCL) also presented related work on a taxonomy of modes of delivery of behaviour change interventions. Susan Michie and Marie Johnston participated in a roundtable on Friday 1 September, the focus of which was fostering UK-US collaborations on investigating mechanisms of action in behaviour change. The discussion centred on the ways in which HBCP work complements work done by the Science of Behaviour Change (SOBC) research network at Columbia University. Susan Michie and Robert West jointly delivered a state-of-art lecture outlining the methodology of the HBCP project, and explaining how it aims to push the boundaries of behaviour change research. This stimulated interesting discussion from the audience on the opportunities that HBCP can bring for improved evidence synthesis and theory development, and the challenges for building a reasoning system for complex behavioural interventions.